With sound and style tough enough to rock a chicken-wire-enclosed stage, the Deluxe Roadhouse Strat is the perfect instrument for tearing it up all night long. Packed with a wide-ranging variety of tones, ranging from tough, wiry single-coil spank to a high-output sound that's perfect for searing leads, this guitar is versatile enough to handle anything you throw at it with style. It's the perfect instrument for a performer who demands sonic flexibility and the ability to easily switch sounds at the drop of a hat. Three Vintage Noiseless pickups offer all the clarity and articulation you've come to expect from Strat pickups - with no hum. A six-position V6 switch disguised as a tone control and preamp offers 6 extra tonal variations, without compromising the classic, slick look of a Strat. An S-1 switch concealed in the volume control bypasses the preamp for rich, traditional pickup-only sounds. Enjoy smoother travel when using the tremolo bridge, thanks to the modern two-point synchronized design, which includes bent steel saddles for classic aesthetics. A contoured neck heel and 4-bolt asymmetrical neck plate make it easy to comfortably reach the upper registers of the neck. The flatter 12"-radius fingerboard makes it easy to play fast leads and perform deep bends without fretting out. Locking short-post tuning machines provide increased break angle at the nut for buzz-free playing and enhanced tuning stability, along with quicker string changes. 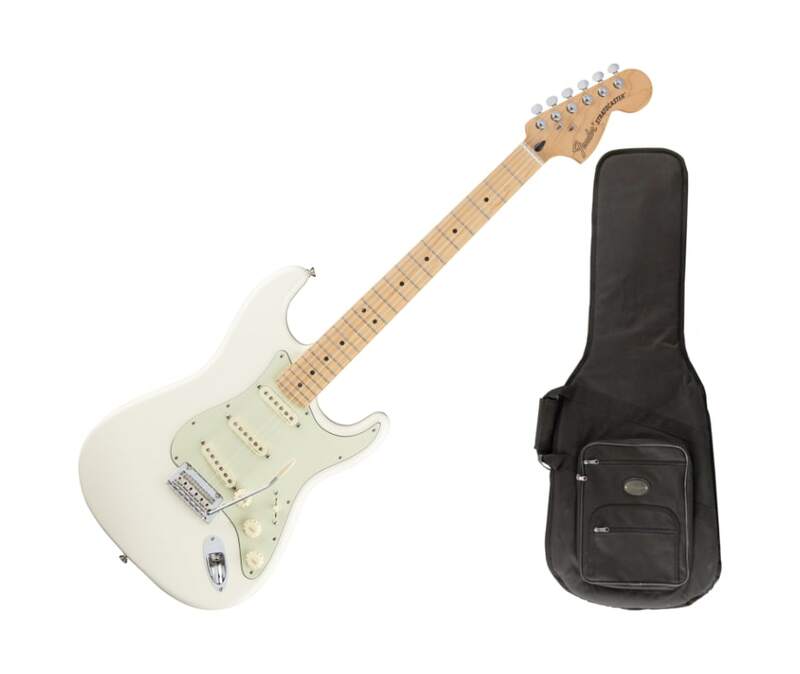 Classic aesthetic touches include nickel/chrome hardware and a three-ply mint green pickguard, 3-Ply Black/White/Black on 384, along with agedwhite pickup covers, control knobs and switch tip.Fusing a near-infinite variety of useful soundswith classic Fender style and upgraded moderncomponents, the Deluxe Roadhouse Strat is theguitar for guitarists who want more from theirinstrument, at an affordable price.